Unless you have a gluten allergy or aversion to sweets, you probably love baked goods. Like, love them. I mean, let’s be real: cookies and milk may be the best food combo of all time. However, as the holiday season rapidly approaches, the Centers for Disease Control and Prevention is reminding folks they should not — under any circumstances — eat raw dough. The guidelines, which were released last week, do not include anything new; however, they are important and timely. For instance, they say that people should not taste, eat or play with raw batter or dough; baked goods should be cooked at the proper temperature and for the specified time; and if raw products have touched a surface, it should be thoroughly cleaned with warm, soapy water. This includes bowls, countertops, utensils and hands. As for why, it all has to do with pathogens and foodborne illnesses. According to the CDC, raw flour can contain E. coli and raw eggs can contain salmonella — and both have the potential to cause serious illnesses. In 2016, an E. coli outbreak linked to raw flour sickened 63 people. But we get it — you’re only human — and if you do sneak a taste, know that the symptoms of salmonella typically appear six to 48 hours after eating a contaminated food, and the symptoms of E. coli usually appear after three or four days. Both conditions are marked by abdominal cramps, diarrhea and vomiting — so not something you’d want during this festive season — or ever, really. 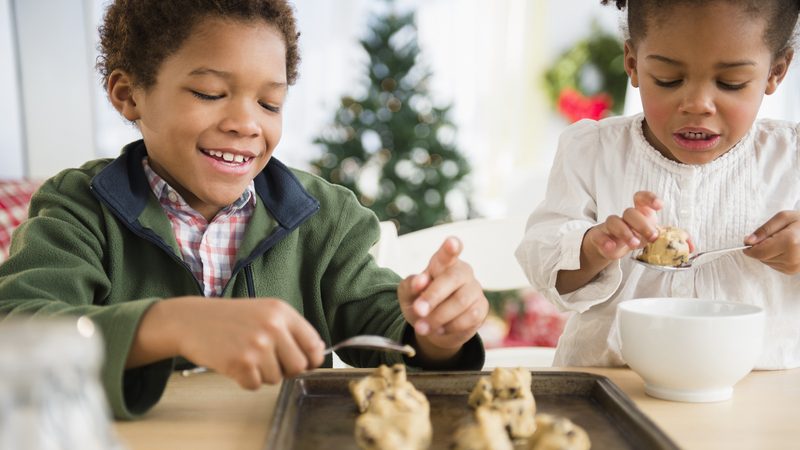 So enjoy your sweets this season, but do so safely — because no one wants to be sick for the holidays.